Britain’s Prince Harry sidestepped political controversy by refusing to reveal whether former President Barack Obama would be on his wedding guest list. Following massive protests in June, the UK government put Trump’s official state visit on hold for the foreseeable future. Prince Harry will marry Meghan Markle on Saturday, May 19 at St. George’s Chapel in Windsor Castle, so the two have a few months to get the guest list together. Though the Queen may not attend the wedding, Buckingham Palace will still play a sizeable role in its planning. In November, British Prime Minister Theresa May said “it was wrong” for Trump to retweet several anti-Muslim videos from a British far-right nationalist group. He responded by attacking her on Twitter. The spat even fuelled speculation that the US president might be be arrested for violating British law if he were to arrive. UK House of Commons Speaker John Bercow said Trump would be barred from speaking in parliament because of the retweets. 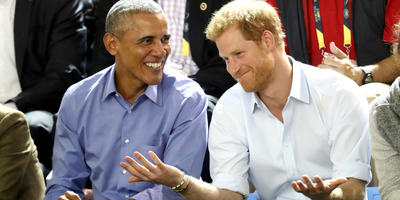 Prince Harry, who is fifth in line for the throne (for now), made the reserved comments about his wedding to the BBC after he conducted an interview with Obama last week, during which the pair exchanged common views on social media use, and discussed Obama’s thoughts on the day his term ended.